Sicily on Wikipedia – This web site includes information about each town and info about the geography, art and history of Sicily. It even tells you about the trains, autos and airports! Flags of Sicily and Italy – This site has many flags of Sicily and Italy. You can also link to a hisotry of Italy, mapes showing the hisotyr of Italy and Sicily, coat of arms and much more. Did your ancestor fight with Garibaldi? Check this site for a listing of 1090 who did! You can also check the Archivio di Stato di Torino page which has a searchable database too. small bit of history and information about the town. Information about each Sicilian Town – Click on the name of the comune you are interested in and you will get all sorts of interesting information including history, popular tourist spots, local products and handicrafts, travel information, recipes, and the best part: the most common surnames for that comune! Arberesh Cities – In the 1400s, many Albanians emigrated to Italy and they settled many cities in Sicily, Calabria and Cosenza. More on this topic can be found at History of Albanians in Italy, Arberesh Mailing List, and Sicilian Peoples: The Albanians. 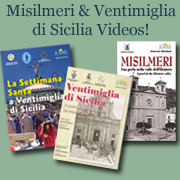 SicilyVideo.it – Here you can purchase a documentary type video of the town where your ancestors are from. Giovanni Montanti has made this video for about 45 towns in Sicily and is currently working on a video for Ventimiglia di Sicilia, which has been sponsored by myself and other families in America who descend from Ventimiglia di Sicilia. To purchase the Ventimiglia video, CLICK HERE. Giovanni has already completed the video for Misilmeri, which I also sponsored. To purchase the Misilmeri video, CLICK HERE. If you find that your ancestral town is not one that he has already filmed, contact him about sponsoring him to make the video for you and your fellow descendants. See the Additional Town Databases page for some of the Archives that have vital records available online. Italian Embassies around the world – This web site has a listing of all Italian Embassy offices around the world with phone numbers, addresses and email addresses. CAP-Italian Postal Codes – Here you will find all the postal codes so that you can mail letters to Italy. You can search by postal code, name of town, or pick a region, then a province, then a town. David Rumsey Historical Map Collection – Scroll down to Italy (or anywhere else for that matter) and explore and examine all the old maps. Fascinating and can be quite helpful! Map a name in Italy – This site allows you to enter a surname (cognome) and it will place a dot on the map of Italy for every time that name is found in the white pages. The bigger the dot, the more people that are there! You can do the same for the United States. Distance Between Towns – Use this website to find out how far it is from one town in Italy to another. Time Zone Converter – Want to know what time it is in Italy or anywhere else in the world? This is the place to find out! Italian Script Tutorial—This page gives you lots of information about deciphering old handwriting. On the left hand tool bar look for alphabet charts to see the way letters were written and click Italian surnames to see a helpful list of frequently used foundling surnames. Some pages are under construction. Behind The Names – The etymology of Italian first names is discussed here, with a huge listing of Italian first names with their origins and English equivalents. You can also try First Name Translator.